Koraishutir Kochuri is a quintessential food of winter. In winter the sight of fresh peas always makes me remember Kochuri at first, then come the other dishes which taste exceptionally good when made with fresh winter peas like Gobi matar, Aloo matar, Matar Paneer etc. 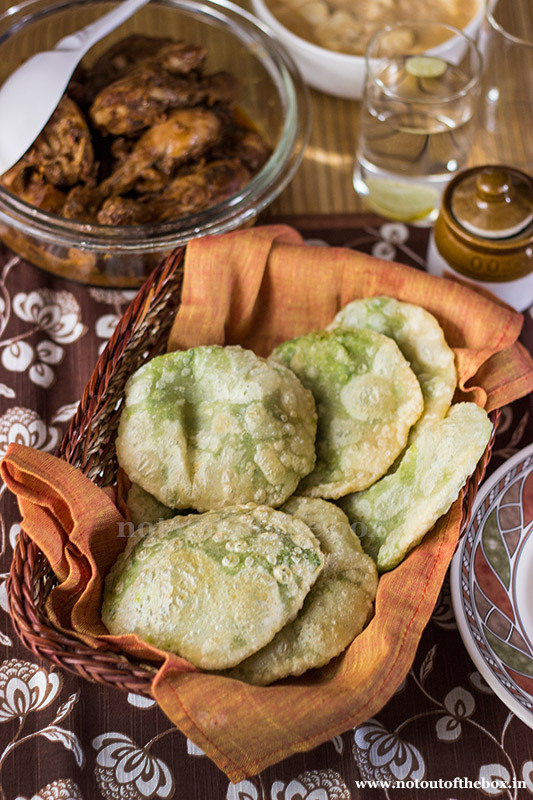 There are a few varieties of Peas Kachori can be found in our country. 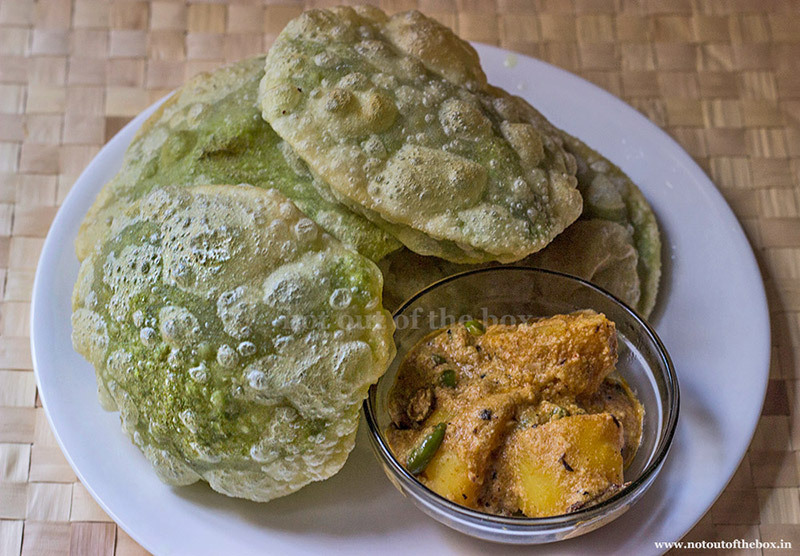 This traditional Bengali version is less spicy, the taste comes more from fresh peas. I know that we can make this with frozen peas too, but when made with fresh peas the taste is unbeatable. 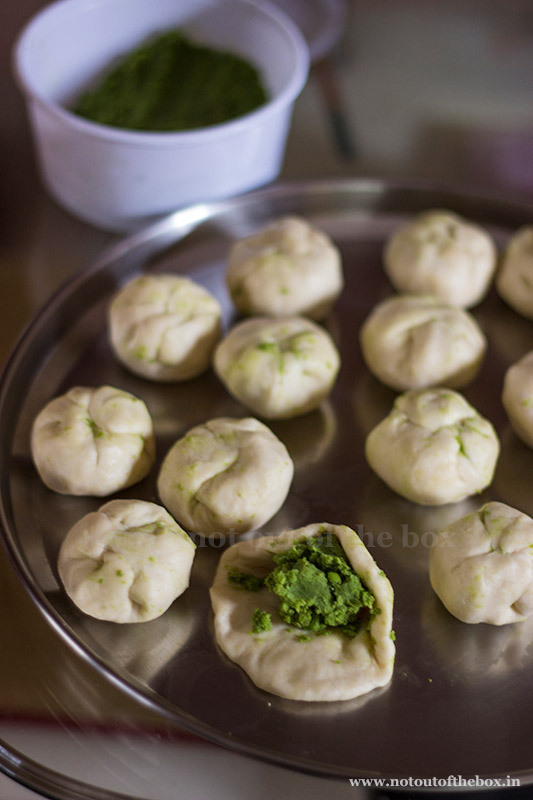 These delicious fresh green peas stuffed soft, flaky kachoris with hot, smokey Aloor Dom is a dreamlike breakfast to any Bengali on cold winter mornings or we can have them for lunch or dinner too. This season is such a spoiler when it comes to having different food. Nature’s bounty and the random urge to keep the body warm push us to eat this or that constantly. And I don’t mind because this season is here for only a few months. Add fresh peas in a mixer/grinder. Grind until a coarse paste form. Keep aside. Heat oil in a deep frying pan/kadai (non-stick preferably). Add the paste of green peas, salt, and roasted Cumin seeds powder. Mix well and cook on medium flame. Stir continuously for 5-6 minutes or until the paste leaves the pan. Care should be taken not to dry up the peas filling too much. The filing should be a bit moist. Remove and keep aside. For making Kochuri the wheat flour part is completely optional but strongly recommended. 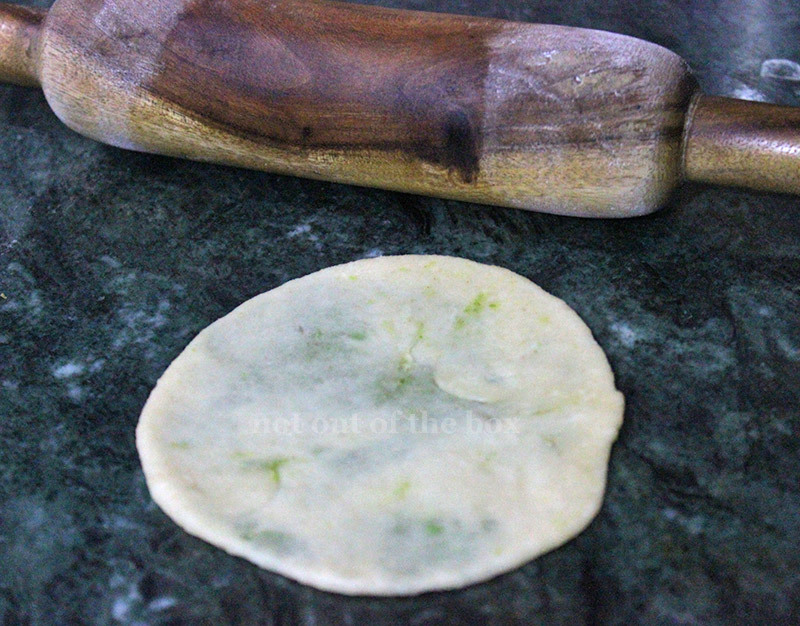 Many people make kachori using maida only, but I’ve seen my Mom always used to add some wheat flour to the dough. It brings out much better taste than those Kachoris which are made with 100% maida. In a bowl add all the ingredients (except water). Mix well using your fingers. The flour mixture will become crumbly in texture. Now add water slowly, and knead until smooth, lump-free dough forms. I knead the dough on my kitchen counter to get a large free space for smooth kneading. The final dough will be smooth, soft and completely non-sticky. Make balls out of the dough, the size of these balls should be a bit bigger than lemons. 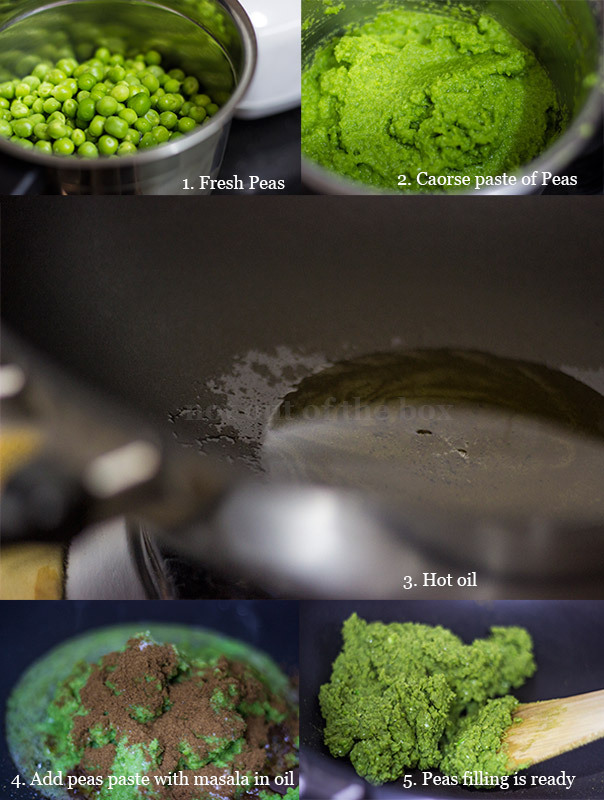 Now press each ball from the centre by using your thumb, and put 1 tbsp peas filling. Close the sides by folding them towards the centre and seal the ball (check out the picture for reference). At the time of rolling apply few drops of oil on each ball. Do this for one ball at a time, when you begin to roll. And grease the rolling surface with little oil too; you need to do this every time before rolling each ball. Start rolling evenly; the approx length of kochuri should be 4”-5” measured by diameter. Kochuri should not be very thick, neither very thin. Keep the rolled kochuri aside separated from each other; otherwise, they will stick with one another. Meanwhile, heat 3 cups of oil in a deep frying pan/kadai. The oil should be hot, not smoky. Start to fry kochuri on high flame, one at a time. When the oil becomes very hot reduce the flame little bit. But don’t fry them on low flame; otherwise, they wouldn’t be puffed up. It will take less than a minute to fry one kochuri. Check the video below for a quick reference on how to roll out and fry Kochuri perfectly. You don’t need to give gentle pressure on top of the kochuri at the time of frying with your perforated spoon or spatula whatever you’re using. Just keep on splashing oil from the edges with the spatula and flip kochuri after 6-8 seconds approx, fry the other side quickly. It’ll take a few more seconds. Take them out in a big bowl. Serve immediately with Cholar dal, Dum aloo, Kosha mangsho etc. If you fry Kochuri for a little longer time, say for few more seconds, it may harden. So timing is very important here. We want our kochuri to be soft and puffy not hard and crisp. Very nice,i like it .